I mentioned that Little Sis has been reviewing some of the Playmobil 1-2-3 range. 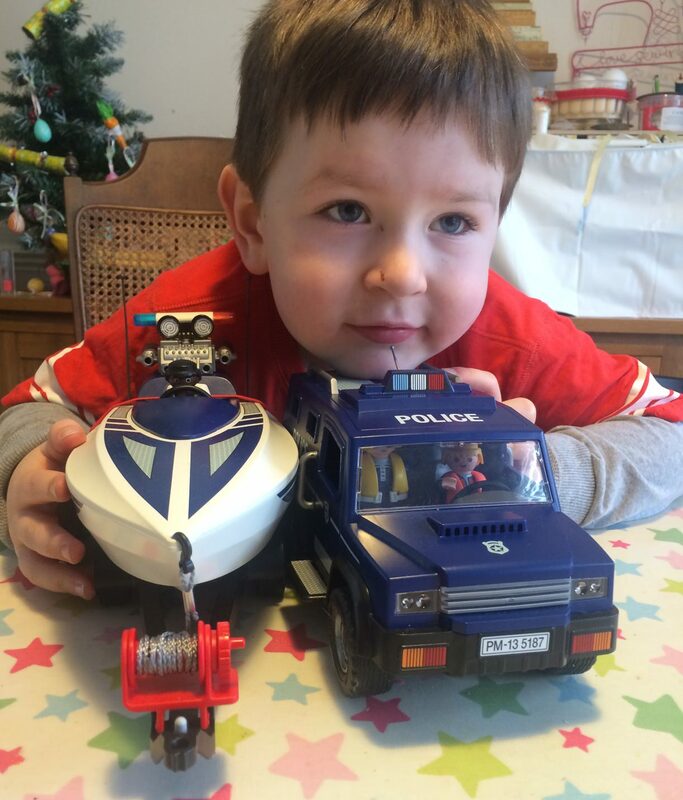 Her older brother was sent the new Playmobil police truck with speedboat set 5187 to review. It’s a really lovely set and pretty easy to put together although the stickers are very fiddly! According to the Playmobil site: Protect by land and sea with the Police Truck with Speedboat. Race to the scene in the police truck, equipped with a removable roof and four working doors that make it easy to seat up to four figures. Kids can also embark on a water investigation with the floating speedboat. Cruise through the water automatically with the included underwater motor, and when the day’s work is over, use the trailer winch to pull the boat into position on the trailer, before connecting it to the truck and driving off to the station. Set includes two police figures, truck, trailer with detachable tow bar (for connecting to the truck), storage box, binoculars, camera, and other accessories. 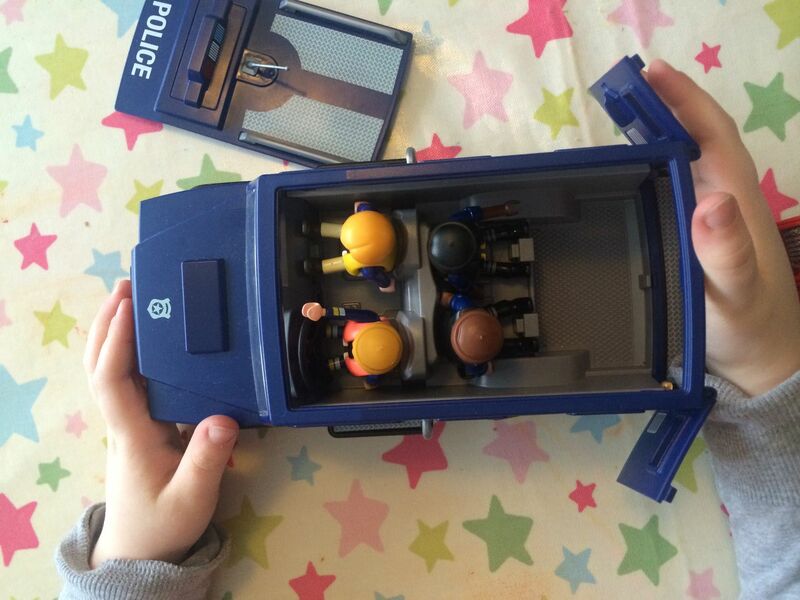 My 3 year old loves the police truck. You can remove the roof which makes playing with it really easy and he loves putting people in and out. He already has a couple of Playmobil boats so likes the speedboat which he’s been playing with in the bath. It has a detachable underwater motor which is fun and we’ll be taking it to use in grandad’s swimming pool in a couple of weeks as our bath is just not big enough. The trailer is also great fun and my son quickly got the hang of it all. The set also includes several people and accessories, I’m afraid the accessories quickly got lost in our general Playmobil box but so far the police figures have stayed with the truck and boat. This is a fun set and great for sparking imaginative play and games. As the weather has improved the truck has been taken outdoors and is a great addition to our Playmobil collection. My only criticism is the packaging. Unlike most toys I don’t think Playmobil sets are packaged well. The boxes look great but I always find it a little disappointing that the contents just rattle around as the boxes are always much bigger than the contents and when you open the box the pieces fall out, but that’s a pretty minor point. This set is priced at £39.99 and is good value for the police truck, speed boat with motor and trailer. I’m thinking we’ll have ours for many years to come. My kids still like Playmobil so I think you’ll get several years of use. Like Lego, it’s expensive so I always scout around for the best deals. But it’s worth it. Huge Playmobil fans in this house, Kitty and Ozzy are just getting into it and my oldest ones were raised on it. Love the look of the speedboat with it – really encouraging imaginative play! We love playmobil too and the kids got too sets for Christmas – a jungle and a dump truck, both which are played with daily! I used to love playmobil, the police car and speedboat look awesome!